Konrad Dziurdzia is an experienced author, coordinator and executor of many education and research projects/initiatives, encompassing also the history of Central and Eastern Europe (with over 8 years of experience in education and research sector, both public and private). He is a former official of the state-integrated administration and a philologist/teacher by profession. 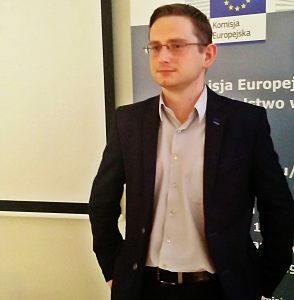 Currently, he holds a number of positions, with a nonpermanent or permanent character, inter alia, he is the Manager of the European Documentation Centre in Łódź (Poland), Advisor to the Vice-Rector of the College of Europe (Natolin Campus), a research coordinator and an expert of the Cross-border Cooperation Programme Interreg V-A Poland –Slovak Republic 2014-2020 (science/education area).